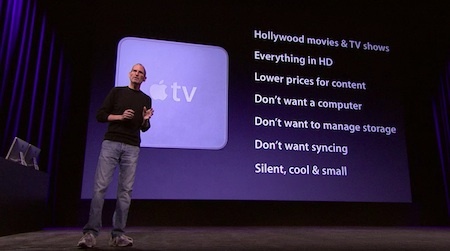 Apple TV just lost its “hobby” status, as Steve Jobs aims directly at yours, and your Granny’s cable box. 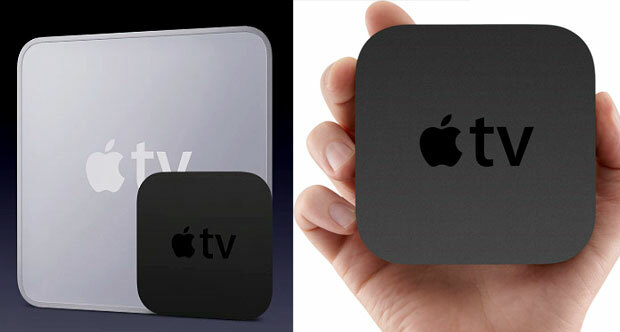 Apple TV received a major overhaul today, and has been turned into a serious contender in the Web TV market. It’s tiny, easy to use, and aimed directly at yours, and your Granny’s TV set-top. 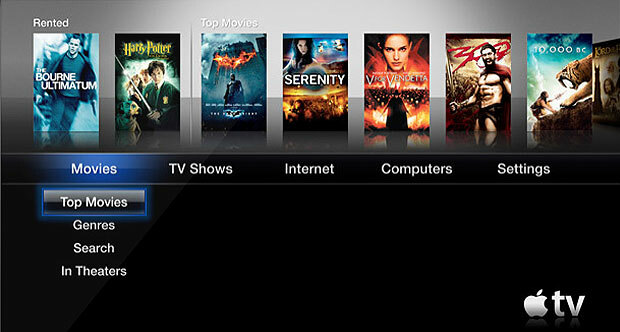 This may even be the first set-top box that is a serious worry for the cable TV industry. Apple user interface, and no need to “sync” the device to anything, or store files on it since everything is streamed from the cloud. 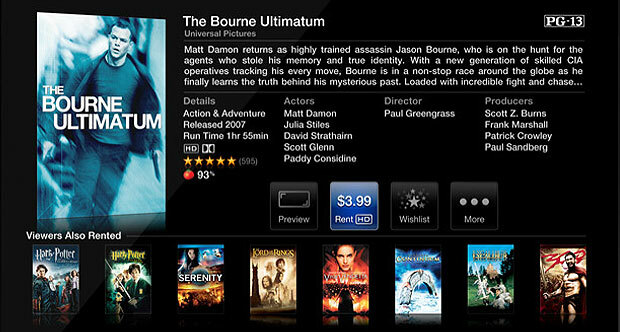 this newness, Jobs joked) to bring streaming rented TV shows for $0.99. streams over the Web already. Rumors of a dramatic transformation of Apple TV have been circulating for months, but very little detail leaked, and no one expected today’s seismic changes. 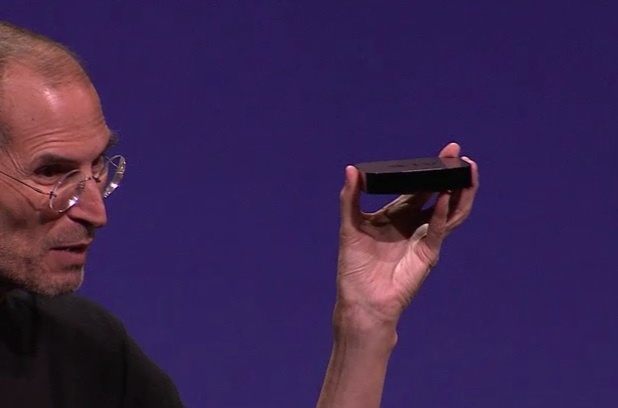 The updated device was CEO Steve Jobs’ irresistible “one more thing” during today’s live event. The original Apple TV launched in 2006, but Apple didn’t put much effort into supporting it over the years, and Jobs even admitted that “it’s never been a huge hit.” But consumers “loved” it, and it seems like user input has been a major element in the updated product design, given the addition of HD quality video, low prices for content, and an easy connection between the device and a 720p-plus HDTV over a simple HDMI cable (good news, technophobes everywhere!). The ability to stream directly from your Mac or iPad offers some intriguing possibilities as well–since Apple TV has WiFi its external hard drive can be your desktop computer. Viewers also want “Hollywood movies and TV shows” Jobs remarked, rather than “amateur hour”–a large dig at Google’s YouTube, which is something of a surprise since there’s a direct YouTube link built in to the new system, just as in iOS devices. Like the surprisingly low entry price of the iPad, the Apple TV’s price point is so very carefully positioned that it’ll appeal to millions of consumers to whom the concept of “set-top boxes” is currently an alien piece of thinking. With its ability to stream content from MobileMe, as well as Flickr, this price means thousands of folk will be buying one for Granny and Grandpa, to keep the oldies up on the latest family photos and videos. The only downside, which may limit the TV’s international appeal at first, is that it’s a fairly U.S.-centric gizmo. At launch, iTunes TV shows and Netflix content will only be available in the U.S., and iTunes movie rentals only in the U.S., U.K., Australia, Canada, France, Germany, Ireland and New Zealand. Once the service kicks off, though, this may change–there’s nothing like a hot-selling Apple device to make an entire industry rethink itself, as has been proven several times over.